Drench your skin with luxurious moisture with Nourishing Collagen Cream. Clinically tested and proven to minimize the appearance of fine lines and wrinkles, this rich, inviting formula bathes skin in a moisture-saturated complex of Hydroelastin, Mucopolysaccharides and pure Swiss Collagen. Comforting to the skin, Nourishing Collagen Cream plumps skin cells and supports a youthful moisture balance. Soothes and pampers with natural Aloe Vera, Pro-Vitamin B5 (Panthenol) and Cucumber Extract. Skin looks and feels soft, smooth and very moist. Ingredients: Water, Glyceryl Stearate SE, Squalane, Propylene Glycol, PEG-100 Stearate, Isostearyl Alcohol, Dimethicone, Soluble Collagen, Aloe Vera Gel, Hydrolyzed Elastin, Panthenol, Glycosaminoglycans, Cucumber Extract, Glycerin, Methylparaben, Butylparaben, Ethylparaben, Propylparaben, Isobutylparaben, Phenoxyethanol, Carbomer, Tetrahydroxypropyl Ethylenediamine, Fragrance. To support the skin’s moisture balance and promote the look and feel of fresh, youthful skin. To help deliver moisture to thirsty skin cells being dried out by environmental factors such as sunshine, dry air and cold temperatures and as the result of age-related loss of moisture. To help cells close to the skin surface function as plump, young cells by adding easily-absorbed, moisture-rich ingredients. To help diminish fine lines by smoothing the skin surface with soothing ingredients that work in conjunction with the skin’s natural moisture balance, without relying upon components that can have a greasy feel, and over time leave your skin more prone to dryness. 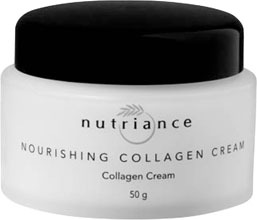 Why Nutriance Nourishing Collagen Cream? Bathes skin in a moisture-saturated complex of Hydroelastin, Mucopolysaccharides and water-soluble, pure Swiss Collagen. More than 76% greater moisture within skin layers even 30 minutes after application, as verified in European clinical testing. Boosts skin’s moisture content with an exclusive combination of Aloe Vera Gel, soluble Collagen and Elastin, Squalane and Dimethicone. Shown in clinical research to moisturize the skin and significantly diminish the appearance of fine lines and wrinkles. Water-based botanicals: Aloe Vera Gel and Cucumber Extract provide a soothing and moisturizing feel, while helping to maintain a healthy skin surface pH. Works with the skin’s natural lipid-to-moisture balance. Contains Squalane that combines with the skin’s own sebaceous lipids to promote youthful moisture levels. Proven formula promotes visible smoothness and suppleness, with a comforting and greaseless feel. Takes a step beyond the Nutriance Synergy Cycle when an extra drink of luxurious moisture is desired for your skin.